Createspace Independent Publishing Platform, 9781535214179, 350pp. From the bestselling author of The Spaceship Next Door: "What I was currently doing with my time and money . . . didn't really deserve anyone else's attention. If I was feeling romantic about it, I'd call it a quest, but all I was really doing was trying to answer a question I'd been ignoring for a thousand years." In his very long life, Adam had encountered only one person who seemed to share his longevity: the mysterious red-haired woman. She appeared throughout history, usually from a distance, nearly always vanishing before he could speak to her. In his last encounter, she actually did vanish-into thin air, right in front of him. The question was how did she do it? To answer, Adam will have to complete a quest he gave up on a thousand years earlier, for an object that may no longer exist. If he can find it, he might be able to do what the red-haired woman did, and if he can do that, maybe he can find her again and ask her who she is . . . and why she seems to hate him. "You are being watched. Move your loved ones to safety . . . trust nobody." But Adam isn't the only one who wants the red-haired woman. There are other forces at work, and after a warning from one of the few men he trusts, Adam realizes how much danger everyone is in. To save his friends and finish his quest he may be forced to bankrupt himself, call in every favor he can, and ultimately trade the one thing he'd never been able to give up before: his life. 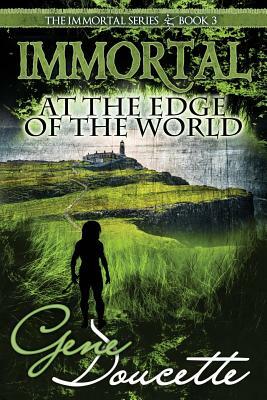 From the author of Immortal and Hellenic Immortal comes Immortal at the Edge of the World, the breathtaking conclusion to the best-selling trilogy. Will Adam survive?